What should you know about HGH Plus IGF 1 & 2? 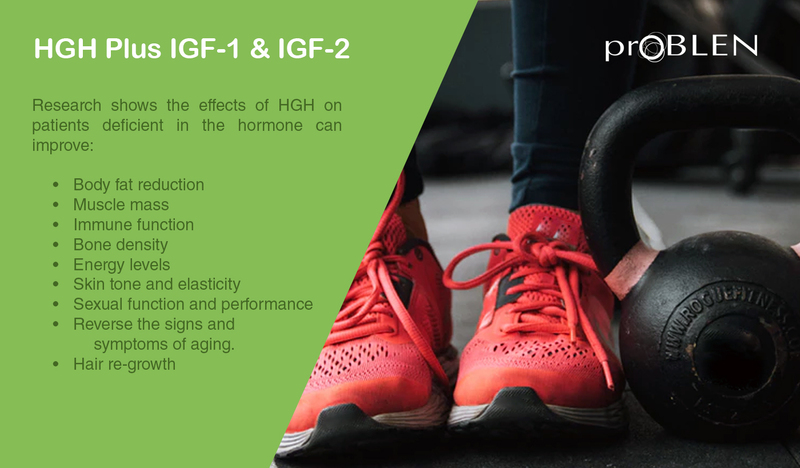 The additional ingredients not only support HGH productions but natural healing as well by using ingredients such as IGF-1 (a concentrate that contains the growth factors found in velvet antler), an enhanced source of our Deer Antler Velvet. Growth Hormone helps bones, muscles, and other tissues grow and generally improve over time. HGH stimulates proteins and fat metabolism and then communicates to the body to use these fatty acids for energy. As people age, the body tends to lower the number of growth hormones that are released during sleep periods. Studies show that sleep is a key component to help release the growth hormones needs for your body’s recovery, this is why our HGH formula may be especially effective when combined with a good night's rest. In addition to good rest, exercise is one of the most effective ways to help the realization of your body’s natural growth hormones. The more difficult the exercise is, the more growth hormones your body typically releases. A recent study found that the growth hormone release is peaked after a workout is completed. Our HGH formula can assist in the optimum release of the required hormones for general improvement. Increased attention and improves an individual’s reaction time when under stress. Boosts energy while increasing potential peak energy strength during a workout and contributes to quick recovery. Stimulates brain by body’s enhancements. Repairs cell assist brain developing new brain cells. Provides an increase in mental energy mood for clear and alert thoughts. Ability to increase strength and muscle tone. Sustained healthy bones and joints. Increase stamina, increase flexibility. Improve recovery and healing. Decrease muscle and joint pain. Temporarily relieves these symptoms due to aging or run down condition. Low energy, poor muscle fat balance. Occasional sleeplessness. Temporarily relieves symptoms associated with low growth hormone levels. Improves Stamina, Vivid Dreams, Improves Sleep and feeling more refreshed upon awakening. More optimistic attitude, increase energy. Better sense of Humor, Improved muscle tone, Enhanced sexual function, Improvement in skin tone, Increase in strength, Better digestion. Weight loss Better eyesight including night vision. Helps to build lean muscle. Boost energy levels, Helps you get more out of your workouts. Increase libido. Stimulates muscle growth and protein synthesis. Contains amino acids that boost HGH. Accelerated recovery time between workouts. Promotes fat burning for a leaner frame. Relieves vertigo, difficult mental concentration, confusion. Hemorrhage, sexual organ development, muscular activity.